"I just want to build boards that I can get barrelled out of my brain on..." Does this sound like a guy who thinks that the performance realm of the SUB is limited to the nose ride? Shaper Allan Cheateaux (allancheateaux@yahoo.com) wants to make boards that push the limits of paddleboard performance. The guy's a fixture at San Onofre and the plus is this: he'll let you hop on any of his boards. Definitely check them out. In the works: I finagled another day of freedom (marriage is all about negotiations) and I'm going to be surfing some private spots in Northern Baja tomorrow- check back and you'll see the results. 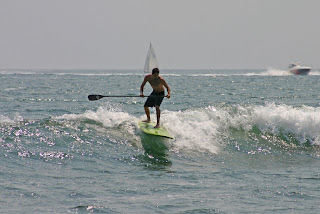 Coming Up: Mike P. at www.international-waterman.com is going to be putting on a paddlesurfing contest in late September. I'm going to enter it because it sounds really fun- check it out at his site. And: The 3rd annual Dempsey Holder surf contest, put on by wildCoast (www.wildcoast.net) will be featuring a stand up surf division this year- contact me if you're interested, I'm in charge of that division- the contest is usually in mid-October.